The 89th Oscars came to a stunning end last night when Warren Beatty and Faye Dunaway announced that La La Land had won Best Picture. 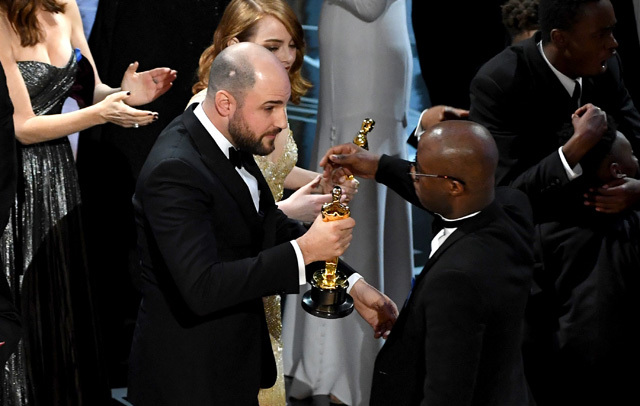 The cast of the crew had come on stage to accept the award, but it was then made clear that Beatty and Dunaway had read opened the wrong envelope and Moonlight was the actual winner. When announcing the winner, Beatty appeared to be stalling, but when he showed Dunaway the envelope, she went ahead and said La La Land. It turns out that they had been handed an envelope for the Best Actress Oscar, which Emma Stone won earlier for La La Land. In past years, PricewaterhouseCoopers has provided two winners’ enveloped for either side of the stage, so there might have been a mix-up there, but we’re not sure yet. If you didn’t get a chance to watch the telecast, you can view the full list of winners by clicking here. You can also view photos from the red carpet in the gallery below.